Onchi is the single most important artist in modern Japanese prints and in the development of abstract expression in Japan. Starting with his first purely abstract work Bright hours (1915), he worked freely both in figurative and abstract works. 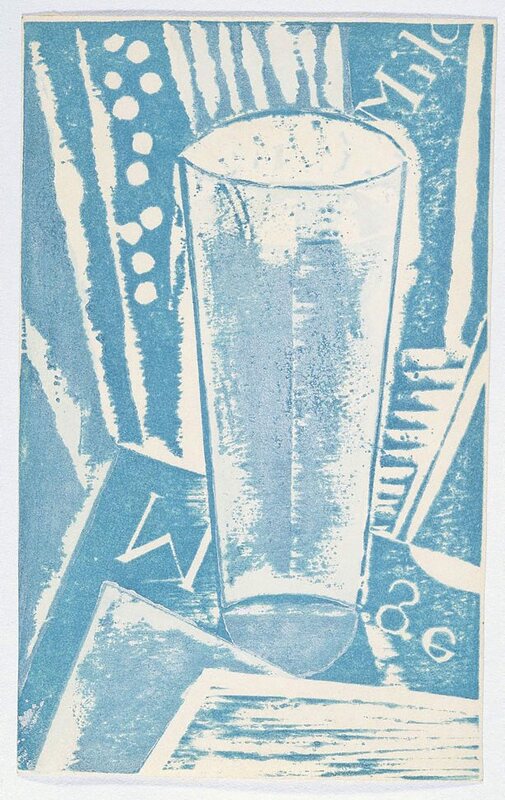 The Morning, depicting a glass of milk in the clean blue and white air of the morning is executed in cubist style. The work was made during the period when, along with avant-garde artists such as Murayama Tomoyoshi and Kanbara Tai, Onchi was experimenting with Western (particularly German) modernist styles. He kept a certain distance from the other avant-garde artists, however, perhaps because of his deep love for the poetic and the lyrical, a sentiment which was little shared by the others. This print, like many others produced in the 1920s and 30s, was published in a small-circulation print magazine called Sen [Lines]. The morning is peaceful but feeble. Milk forms the sick one's skin. Asian Art Dept, AGNSW, October 1999.